President George W. Bush: Short biography of President George W. Bush and the key events during his presidency. George W Bush, nicknamed the "Dubya", was the 43rd American President and served in office from 2001-2009. 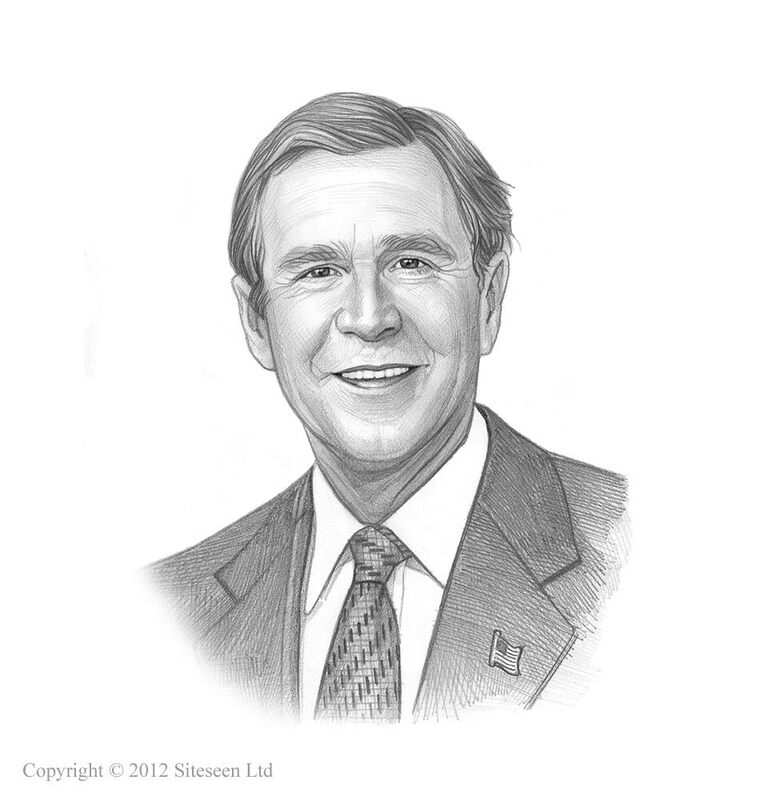 The Presidency of George W Bush spanned the period in United States history that encompasses the events of the Modern Era and the rise of terrorism. President George W Bush represented the Republican political party which influenced the domestic and foreign policies of his presidency. The George W Bush presidency began with the 9/11 Terrorist Attacks on the World Trade Center after which he announced the War on Terror that triggered the Afghanistan War (2001 - 2014), the hunt for Osama bin Laden and other members of Al-Qaeda, the continuing Iraq War (2003 - 2011) against Saddam Hussein, and the establishment of the Guantanamo Bay detention camp. At home, George W Bush USA Patriot Act was passed and the Department of Homeland Security was formed. The Enron Scandal erupted in 2001, Hurricane Katrina caused catastrophic damage in 2005 and the 2008 Financial Crisis hit the economy triggering recession and depression during the presidency of George W Bush. The next president was Barack Obama. The nickname of President George W Bush provides an insight into how the man was viewed by the American public during his presidency. The meaning of the nickname "Dubya" refers to the Texan accent when saying the letter W, as in G.W. Bush. The character traits of President George W Bush can be described as optimistic, outgoing, spirited, bombastic, energetic and inquisitive. It has been speculated that the Myers-Briggs personality type for George W Bush is an ESTP (introversion, intuition, thinking, perceiving). An outgoing, active, influential and resourceful character with the ability to improvise to achieve desired results. George W Bush Personality type: Socially sophisticated, persuasive, competitive and easily bored. Summary of the 9/11 Terrorist Attacks: The 9/11 Terrorist Attacks on the World Trade Center, the pentagon and in Pennsylvania by four coordinated groups of radical Islamic suicide bombers occured on Tuesday September 11, 2001. The 9/11 Terror Attacks were masterminded by the terrorist group Al-Qaeda resulted in the deaths of over 3000 people with hundreds more shocked and injured. Summary of the Anthrax attacks: Between September and November 2001 the Anthrax attacks began in America, just after the 9/11 attacks. Letters, laced with lethal anthrax spores, were sent to two Democratic U.S. Senators and news media companies. The Anthrax attacks caused the death of 5 people and 17 others suffered illness after they were infected after exposure. Summary of the War on Terror: George W Bush declared the War on Terror following the 9/11 Terrorist Attacks targeting all those who committed violent acts of both Domestic and International Terrorism, particularly Al-Qaeda members and Osama Bin Laden. Providing Appropriate Tools Required to Intercept and Obstruct Terrorism Act of 2001". Summary of Al-Qaeda: The radical Islamic terrorist group Al-Qaeda, led by Osama Bin Laden, had emerged between 1988 - 1989. The goal of the intensely anti-American Al-Qaeda was to undermine the influence of the West and to institute Islamic law. In 1996 Al Qaeda established training camps in Afghanistan and began to prepare to undertake bombings and terrorist attacks in the United States and Western nations. Summary of the Taliban: In September 1996 another radical fundamentalist movement in Afghanistan called the Taliban, who had originated in Pakistan, had taken control of large parts of Afghanistan with Kandahar as the capital. The Taliban became closely allied to Al Qaeda when the group established the Al Qaeda training camps in Afghanistan. Summary of the Afghanistan War: The Afghanistan War (2001 - 2014) in which the United States of America invaded Afghanistan was triggered by the September 11 attacks. On October 7, 2001 the United States and Britain began to bomb terrorist targets, such as the Al-Qaeda camps and the military forces of the Taliban. Summary of Guantanamo Bay: The Guantanamo Bay detention camp (aka Gitmo), located in Cuba, was established in January 2002 to house Muslim militants and suspected Al-Qaeda and Taliban terrorists captured by U.S. forces in the War on Terror. Summary of the Department of Homeland Security: The Department of Homeland Security became operational on January 24, 2003 to prevent terrorism and enhance homeland security, manage US borders, enforce US immigration laws, safeguard secure cyberspace and ensure resilience to disasters. Summary of the Iraq War: The Iraq War (2003 - 2011) was fought between Iraq, led by Saddam Hussein, and a coalition of forces led by the United States and the British from March 20, 2003 to December 18, 2011. Iraq broke the peace terms of the Gulf War (1990 – 1991), failing to comply with UN weapons inspectors and relinquish weapons of mass destruction and ballistic missiles. Saddam Hussein, the President of Iraq, refused to step down and in March 2003 George W Bush authorized US troops to lead the invasion of Iraq that resulted in the execution of Saddam Hussein and the overthrow of his regime. Summary of the No Child Left Behind Act: The No Child Left Behind Act was passed by George W Bush on January 8, 2002 requiring standardized math and reading tests. Summary of the Hurricane Katrina: The Category 5 Hurricane Katrina hit the Gulf Coast of the US between August 23, 2005 – August 31, 2005 and swept across 7 US states leaving one million Americans homeless. The worst hit area was New Orleans, Louisiana. Hurricane Katrina caused the deaths of at least nearly 2000 people, $300 billion of damage and widespread flooding and was one of the most devastating natural disasters in the history of the United States. Summary of the 2008 Financial Crisis: The 2008 Financial Crisis, aka the Credit Crunch, triggered recession and depression across the US and severely damaged global economies. The 2008 Financial Crisis was sparked by a loss of confidence by investors in the mortgage and loan markets in the United States. The period of severe economic downturn lasted from 2008 and 2013 with low growth and rising unemployment and homelessness.